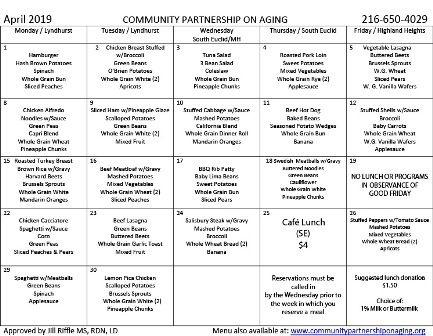 Community Partnership on Aging this Spring! 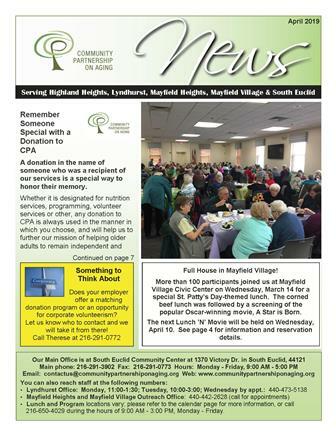 An Ethnic Market Trip, new ACCESS programs, the Annual Movie Day and Luncheon and lots more. Scroll through our home page to find something for everyone! Thanks so much to Atlas Cinemas Eastgate who for many years has supported Community Partnership on Aging through a generous donation of a theater for a matinee movie! This year’s movie is an oldie but a goodie, and has been remade twice since the original: Love Affair (1939) starring Irene Dunn and Charles Boyer. 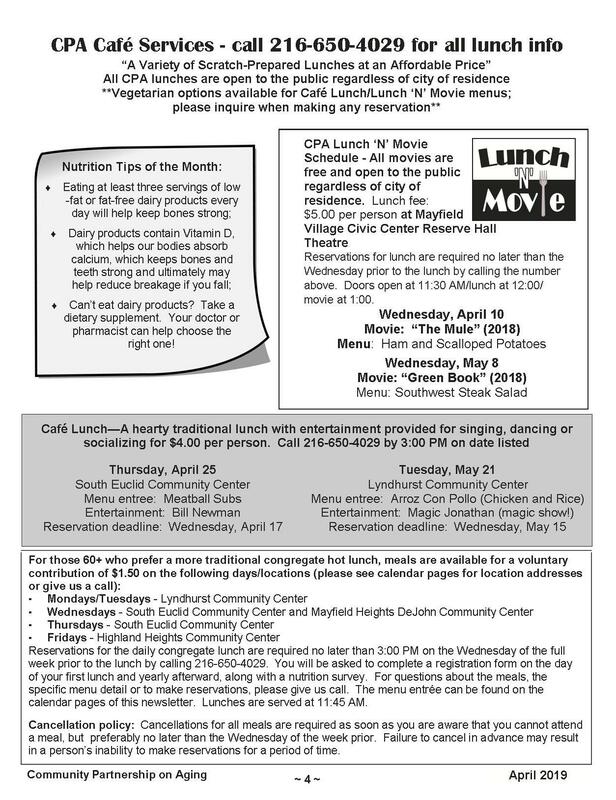 Tickets for the movie as well as the lunch are limited; please call 216-650-4029 or stop in at a CPA lunch location in South Euclid, Lyndhurst, Highland Heights or Mayfield Heights to talk to staff about your reservation. 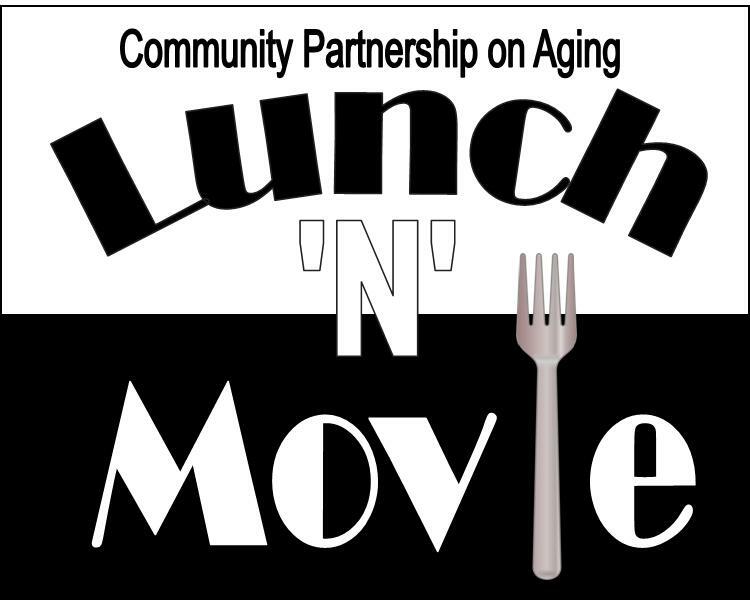 Additionally, the event cannot be possible without the support of many local businesses that contribute in order to provide the lunch as well as popcorn and beverages for everyone in attendance! Click here to view the list of sponsors. Thank you to Dr. Connie Korosec and students, Chef Bob Sferra and staff of Bob Sferra Culinary Occasions, the models and all of our volunteers for another fun fashion show event! Click here to view pictures from the event on the CPA Facebook page. 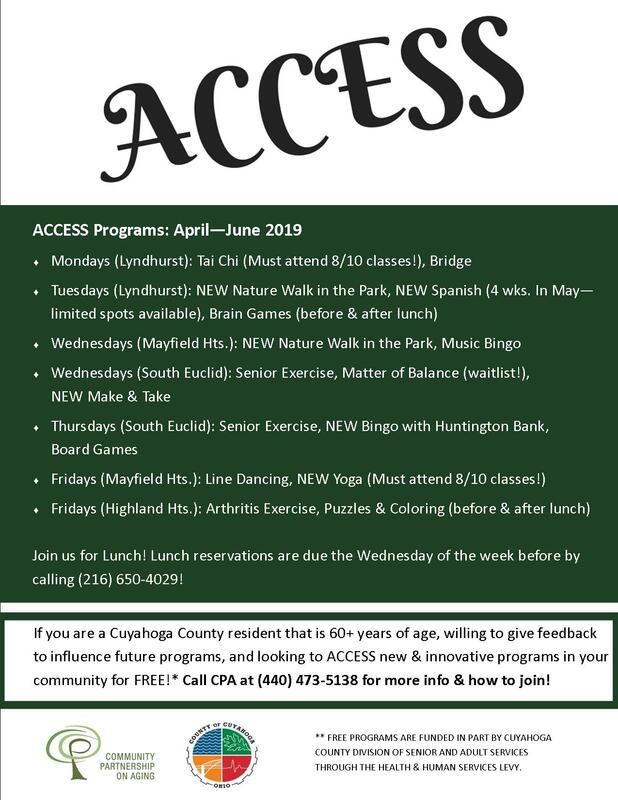 ACCESS – Second Quarter Programs Announced! Are you 60 years of age or older and live in Cuyahoga County? Are you willing to give feedback in order to influence new programs? Are you looking to ACCESS new and innovative programs in your community for FREE? If you answered YES to all of these questions, CPA wants YOU to join ACCESS! A number of existing programs are eligible for ACCESS, and new programs are in the works. Do you enjoy arts and craft projects? Walking for health and fun? How about Bingo for fun? Click here to view the flyer to see all the second quarter ACCESS Program options! Call Carolyn at 440-473-5138 for more information. Effective March 1, applications will be accepted for summer home repair projects which will be conducted by skilled volunteers. Based on the experience of the volunteers, these might include exterior painting, minor plumbing jobs, gutter repair (not cleaning), landscaping (not grass cutting or tree work), carpentry jobs, screen repair, etc. Individuals requesting help will be screened by our social work staff as to financial need. Click here for more information and to access the application. CPA “Learn & Go” – in partnership with University Circle, Inc.
“Learn & Go” brings a series of video conference programs AND a corresponding field trip to a local venue. The next Learn & Go Programs will be announced soon. Upcoming trips are to the Rock & Roll Hall of Fame and the Cleveland History Center. Click here to view the flyers with details! New year, new you. Tai Chi or Yoga with Community Partnership on Aging are a great way to start off the new year! Click here to view the flyers. Produce Plus is in full swing! Each month eligible older adult residents of our five CPA communities can shop for select produce items (and sometimes more) courtesy of a program through the Greater Cleveland Food Bank. No reservations are necessary; however participants must meet eligibility (income) guidelines. Click here to read the flyer with details. The CARE Program is in need of volunteers to assist with helping older adults in the area stay safe and independent in their homes. This program would not be successful without the wonderful volunteers who are so generous with their time and talents. We work hard to match your interests with the volunteer opportunities that we have available; check out our application to see where you might fit! 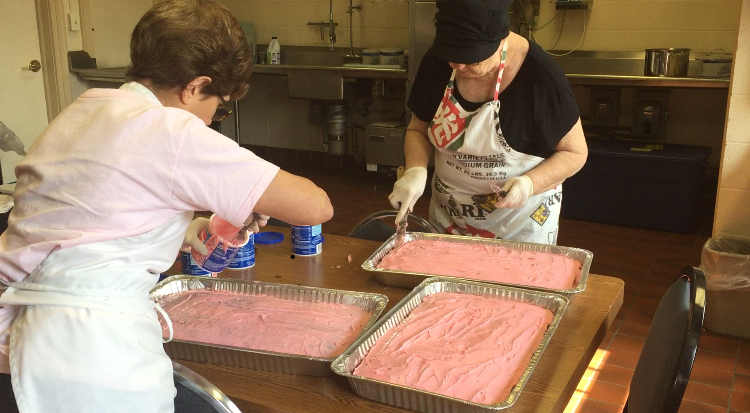 Volunteering with the CARE Program is a great way to get involved and give back and we have a variety of opportunities throughout the year for volunteers of all ages and interest levels. Interested? Have questions? Call (216)848-0594 and ask for CARE Volunteer opportunities or email us your interest at CARE4eight@gmail.com. Click here for more information about CARE, including information about the service bundles and program eligibility. You can also download and print the CARE volunteer application from the link. The CPA Book Club takes place the last Wednesday of each month at the South Euclid Community Center at 12:30 PM. It’s free to join this great group of participants who gather once each month to review books of all genres and enjoy good company and discussion! Check out our newsletter for the current month’s book title. Join CPA every first Wednesday of the month for a Health and Wellness Talk courtesy of UH Center for Lifelong Health! Immediately after Health Talk, participants can get BP, glucose and cholesterol checks courtesy of UH and Manor Care Mayfield. Screenings are first come, first served, but registration is not required for Health Talk. Find us on Facebook, Pinterest and Instagram! Be sure to follow us on your favorite social media platforms. We will be posting on Facebook frequently throughout the week – there you will find articles, pictures, and agency updates. Check out our Instagram and Pinterest pages for even more information! Click the blue word links in this post, or click any of the Social Media icon links near the top of our Home Page. Thank you to the many fine businesses in our area that accept copies of our newsletter at their locations. Click here to view a PDF document of current businesses! Those who choose may also receive a copy mailed to their home by mailing a check for $9 to CPA courtesy of our main office at 1370 Victory Dr., South Euclid, OH 44121. CPA is recognized as a Bright Idea! Bright Ideas is an initiative that recognizes creative and promising government programs and partnerships. The initiative is offered through the Innovations in Government Program, a program of the Ash Center for Democratic Governance and Innovation at Harvard Kennedy School. For more information, click the Bright Ideas logo!